Based on data from the ongoing OGLE Galaxy Variability Survey (OGLE GVS), we have verified observed properties of stars detected by the near-infrared VVV survey in a direction near the Galactic plane at longitude l ≈ -27 deg and recently tentatively classified as classical Cepheids belonging to, hence claimed, a dwarf galaxy at a distance of about 90 kpc from the Galactic Center. Three of four stars are detected in the OGLE GVS I-band images. We show that two of the objects are not variable at all, and the third one with a period of 5.695 days and a nearly sinusoidal light curve of an amplitude of 0.5 mag cannot be a classical Cepheid and is very likely a spotted object. These results together with a very unusual shape of the Ks-band light curve of the fourth star indicate that it is very likely that none of them is a Cepheid and, thus there is no evidence for a background dwarf galaxy. Our observations show that great care must be taken when classifying objects by their low-amplitude close-to-sinusoidal near-infrared light curves, especially with a small number of measurements. 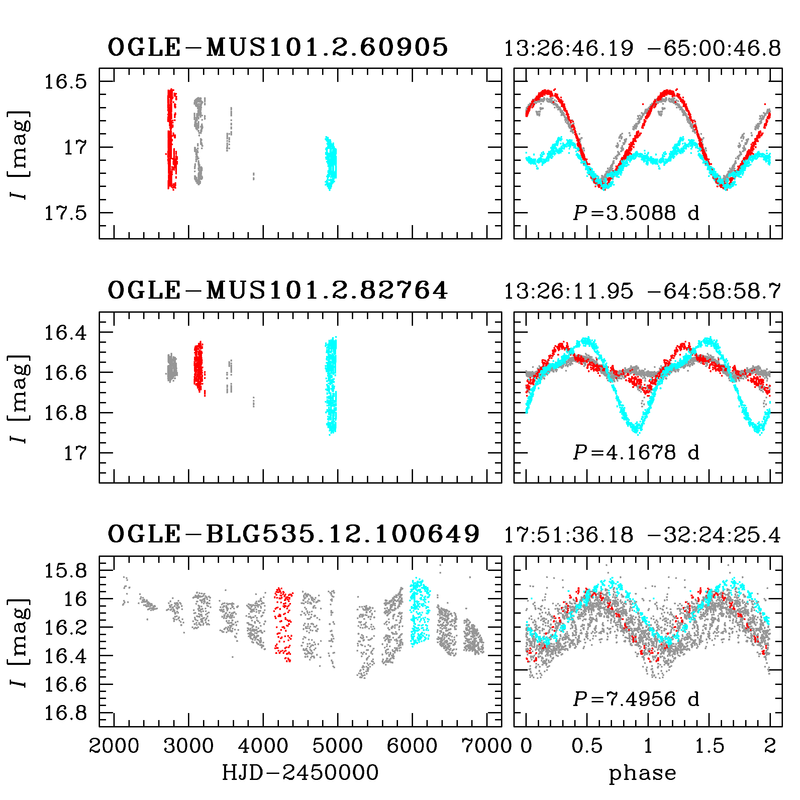 We also provide a sample of high-amplitude spotted stars with periods of a few days that can mimic pulsations and even eclipses (presented below). PLEASE cite the following paper when refering to these results: Pietrukowicz et al., 2015, ApJ, 813, L40, (arXiv:1510.08457). Any comments about the data and the form of their presentation are welcome. Send your messages to this address.